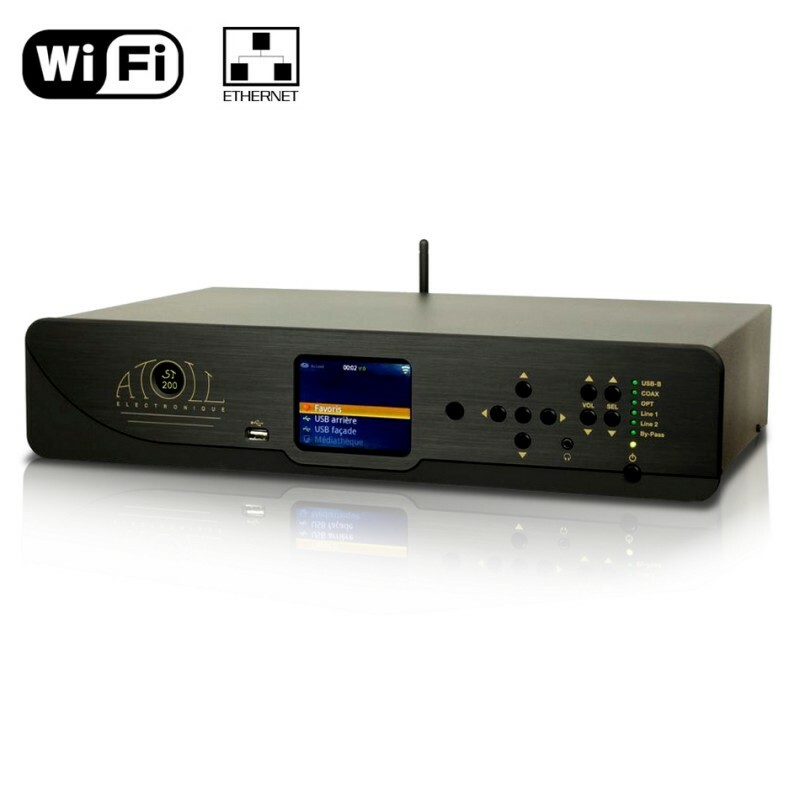 The Atoll ST200 network player is the new and improved version of the Atoll ST100 network player. The ST200 uses a Burr Brown PCM1792 digital-to-analogue converter, while the ST100 uses a Burr Brown 1796 converter, and you can definitely hear the difference in definition. The dynamic range of the ST200 has risen to 129dB, as opposed to ST100’s 123dB. The sheet metal body on both devices is 1.5mm thick, but the front panel of the Atoll ST200 network player is 8mm thick while the front panel of the ST100 is 4mm thick, making the new model more rigid than the old. The Atoll ST200 has two digital inputs, one optical and one coaxial, and two stereo RCA analogue inputs. It also has two digital outputs, one coaxial and one optical, for connecting to a digital-to-analogue converter such as the Atoll DAC200. It also has a stereo analogue output for connecting to an amplifier, as well as an antenna connector (for Wi-Fi) and Ethernet RJ45 port for network connection. On the back panel are two USB inputs, one type A and one type B, and on the front panel is another type A USB input. To the right of the USB input is a colour screen. The Atoll ST200 network player has a set of buttons for browsing the menu, which can also be done using the remote control provided with the product. A free Apple and Android application is also available for controlling the network player. Next to a set of volume buttons is a 3.5mm headphone jack output. These buttons can be used for either headphone listening or when the preamplifier function is being used, as the Atoll ST200 can also be connected to a power amplifier. There are two other buttons which can be used to manually select a source. 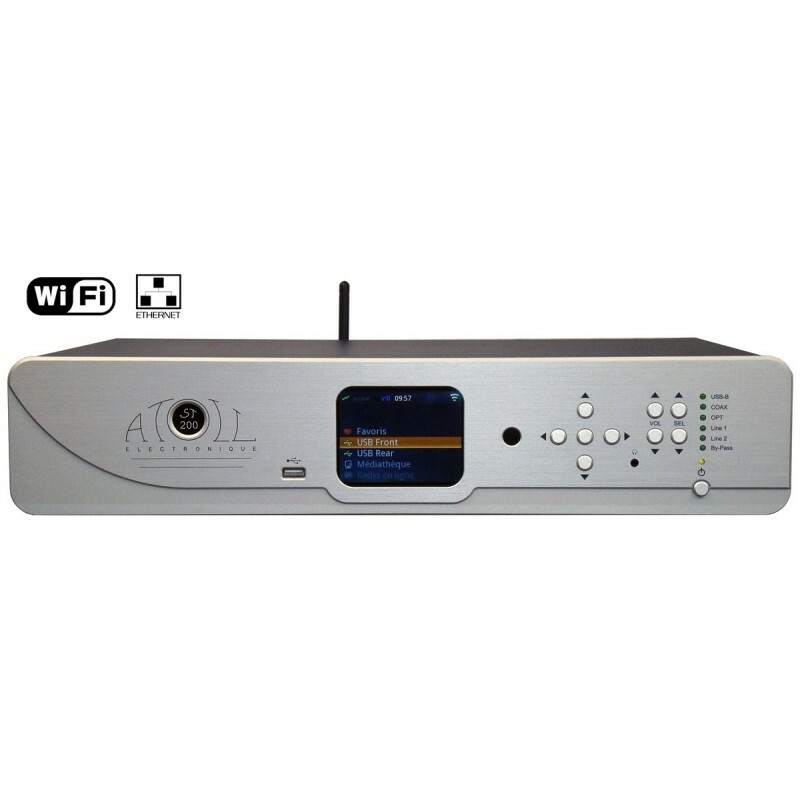 The Atoll ST200 network player gives you access to thousands of internet radio stations (vTuner system), and can also access all of the music stored on your computer or network hard disk (NAS). French brand Atoll has been solidifying its expertise in the Hi-Fi world since 1997. The ST200 network player has everything an audiophile could want for playing HD audio files.